Barrenjoey Head is the location of Barrenjoey Head Lighthouse, a lighthouse which was the third light constructed on the headland, and was lit in 1881. Designed by NSW colonial architect James Barnet at an elevation of 113 m, it is visible to a distance of 19 nautical miles (35 km; 22 mi) out to sea. The correct spelling of the name of the Barra(e)njoey Lighthouse is something for which there is no definitive answer. The original plans for the lighthouse spell it as 'Barrenjuey', but when the lightstation came under the jurisdiction of the Commonwealth Lighthouse Service, it was officially known as the 'Barranjoey Lighthouse'. The Geographical Names Act of 1966 decreed it should be spelt 'Barrenjoey Lighthouse', and this spelling tends to be the most popular usage today. This image belongs to the travel and nature stock photo library. This stock photo of Barrenjoey Lighthouse at Night is available for licensing for commercial and editorial uses including websites, blogs, books, magazines, brochures and advertising. Restrictions may apply for images which contain third party copyrighted material or sensitive subjects. Photos of artwork are for editorial use only. 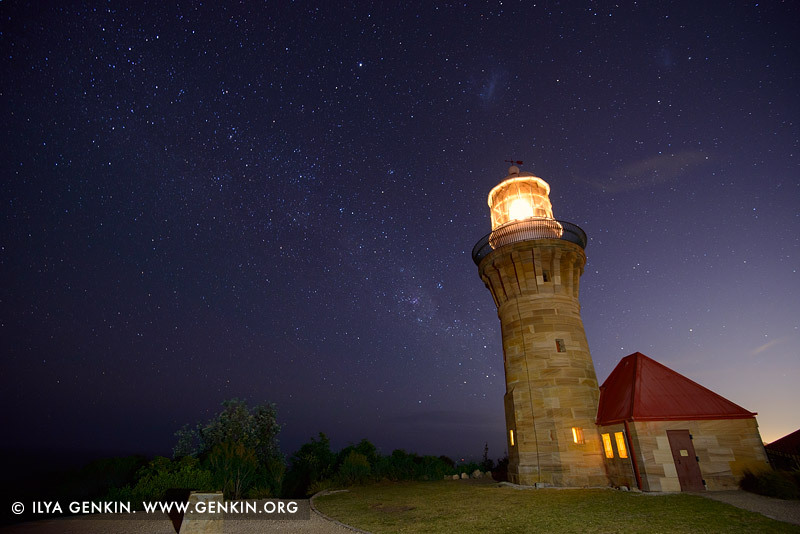 This image id AU-BARRENJOEY-LIGHTHOUSE-0001 of Barrenjoey Lighthouse at Night, is copyrighted © by Ilya Genkin. This is not a public domain image.